We’ve spoken before (as have many before us) of the fact that climate isn’t just about the average, it’s about the whole distribution (the probability distribution if you want to get technical). It set me to wondering, how do things look down under? 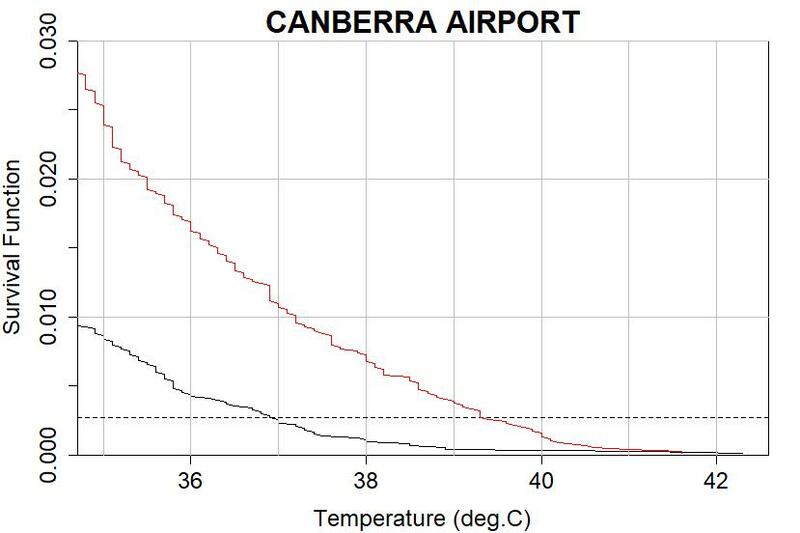 I got daily data from the Australian Bureau of Meteorology for over 100 stations across the continent (their “ACORN” data set), and searched them for “very hot days.” I defined a “very hot day” as one with a high temperature of 100°F (37.78°F) or higher. I hope the Aussies can forgive me for using a definition based on an arbitarty choice (triple-digits) for an arcane (Fahrenheit) temperature scale … but Americans understand it, and few can argue that 100°F or higher makes for a very hot day. I counted how many hot days occur each year, defining the “year” as July-through-June so that summer (Dec-Jan-Feb for southern hemisphererians) won’t be split across years. Then I fit a straight line by least squares, just to test whether or not there’s a trend and which way it’s going. To be eligible, I insisted that a station must have had at least 5 hot days since records began (for most stations, the year 1910). Of the 102 eligible stations, 53 of them showed a linear trend at the 95% confidence level or better. Of course, some of them could be accidental; we’d expect about 5 such cases out of 102 stations just from randomness. Of the 53 stations with significant response, 51 showed an increase in the number of hot days, only 2 showed a decrease. It looks a lot like the distribution shifted to the right, but didn’t change its shape. We also see that the extreme events (both hot and cold) have changed their probabilities profoundly; cold days are a lot less common, while hot days, in this case, anything over 24°C (75.2°F), are a lot more common. The horizontal dashed line is at a probability of 0.002738, which is about 1/365 so at that probability it happens about once a year. Now we see clearly that the chance of reaching or exceeding 35°C (pretty hot at 95°F) used to be less than 1%, but is now closer to 2.5%. That’s a substantial increase in hot weather! Once a year (on average) the temperature would reach about 37°C (98.6°F) or higher, but it now does, on average, 3 or 4 times a year. 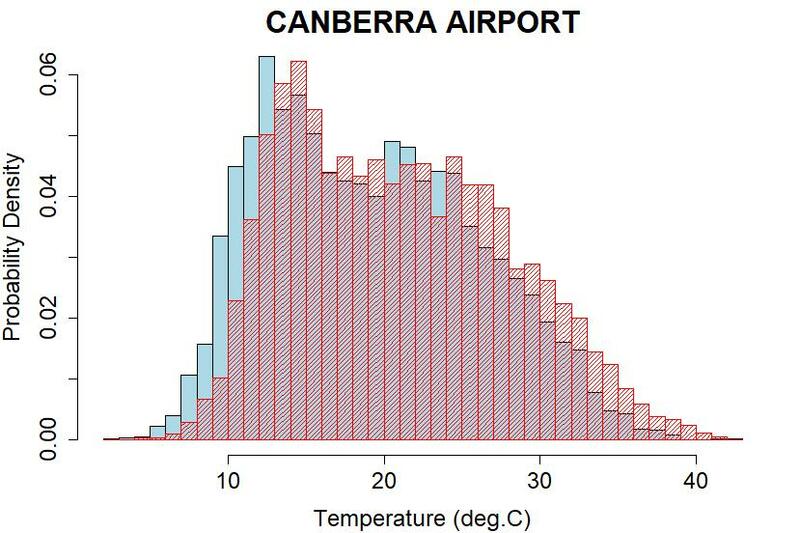 Canberra is hardly one of the “hottest” places in Australia. But it’s hot enough to reach uncomfortable, even dangerous levels during heat waves. Well … they’re happening more often, and they’re getting hotter. The number of very hot days each year (100°F or hotter) has nearly tripled. 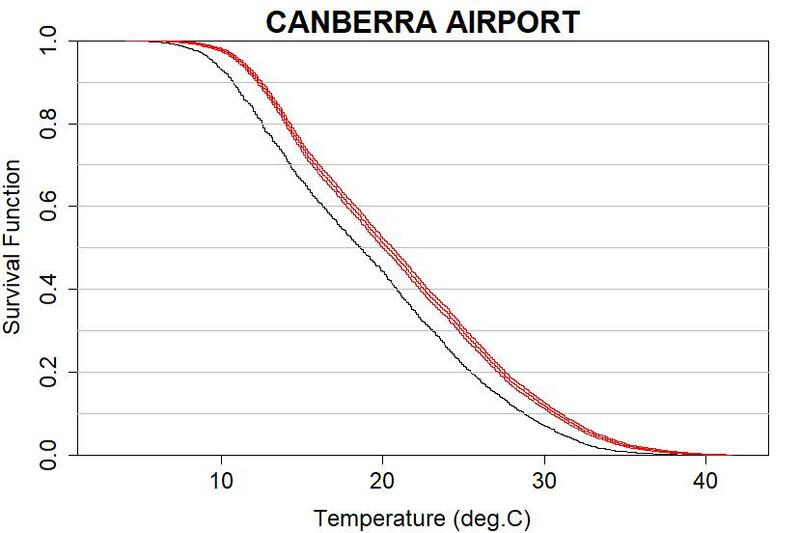 All temperature from 37°C (98.6°F) and above are more likely. Note that about once a year they would reach 41°C (105.8°F) or more, but these days about once a year they’ll make it up to 43°C (109.4°F). 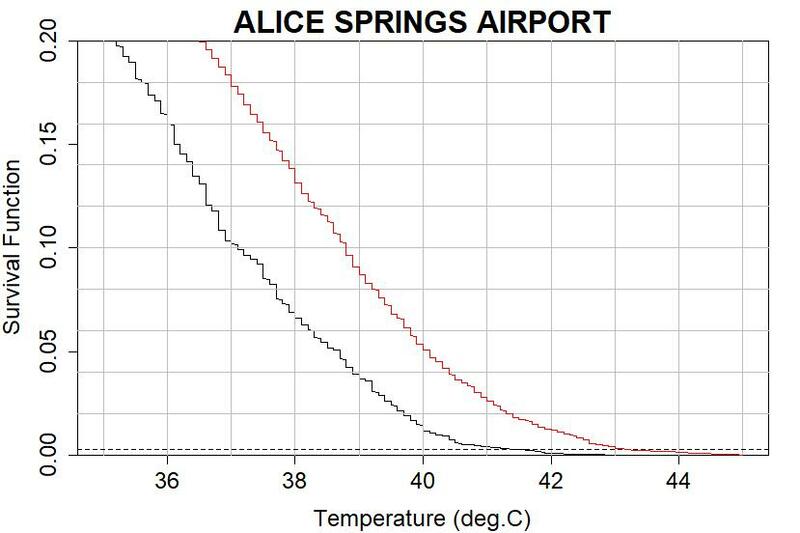 Not only have heat waves gotten more frequent and hotter, in places like Alice Springs they’re reaching extremely dangerous levels. 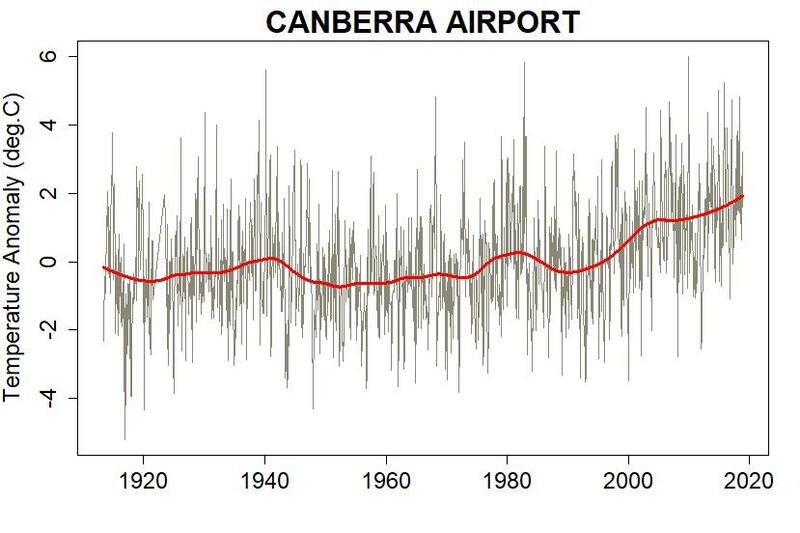 The science about heat waves in Australia is clear: hotter, longer, more. It’s not a “close call.” Australia is already one of the most vulnerable countries to heat waves; the trends bode ill for Aussies. And … it’s going to get worse. Imagine the probability distribution shifted to even higher temperatures. 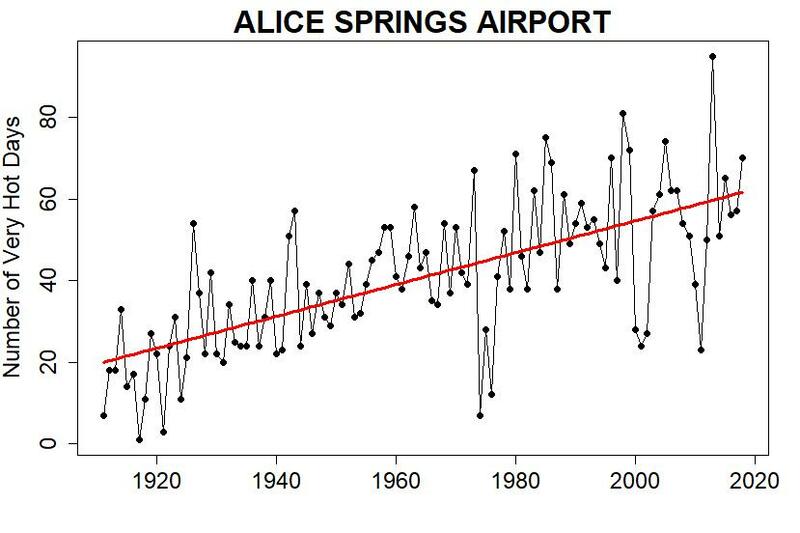 Imagine when the number of very hot days doesn’t just increase, it doesn’t just double or triple, but at some locations becomes a year-round phenomenon. The more this happens, the less the land becomes liveable. Let’s help our brothers and sisters in Australia. And the Kiwis in New Zealand, and the Pacific Island Nations. Let’s help ourselves. Putting a stop to carbon emissions is the way. 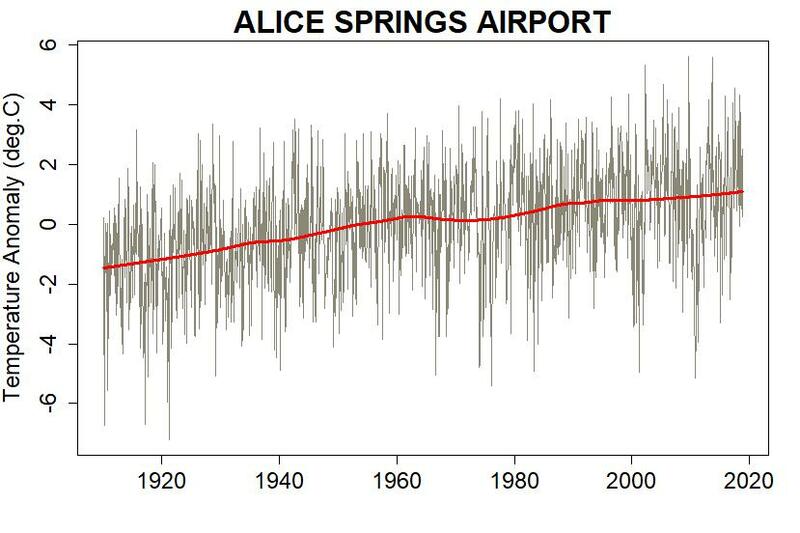 Climate denialist take, “There has been no increase in extremely hot days at Alice Springs Airport since 1998”. >the trends bode ill for Aussies. And … it’s going to get worse. >Professor David Griggs, who recently retired as director of the Sustainable Development Institute at Monash University, said Australia is in denial about climate change. >”Australians will have to adapt or die,” he said. 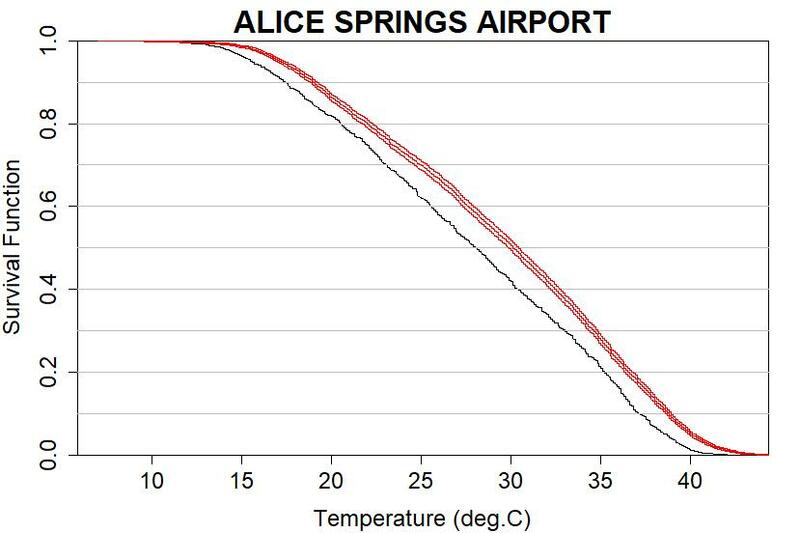 Out of curiosity, I looked up recent temperatures and forecasts for Alice Springs. From 1/10 through 1/26, high temperature every day was (or was forecast to be) above 100 F. Actual temps: 111 (1 day), 109 (4 days), 107 (3 days), 105 (1 day), 101 (1 day); forecast (1/20 to 1/26): 109 (2 days), 107 (3 days), 104 (2 days). I don’t know what the overall history of that place is, but it does seem rather a hot place these days. 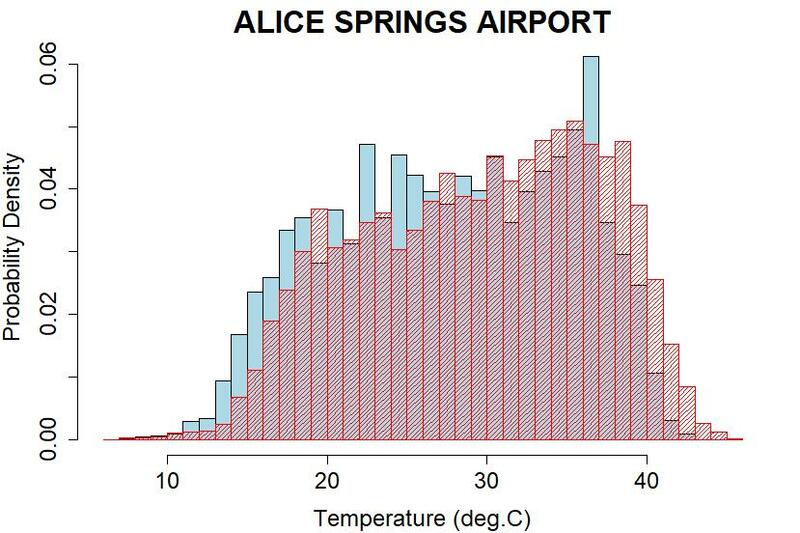 Source of that information was wunderground.com for Alice Springs, Australia. Great job on the analysis! This latest round of 115 degree weather is going to make 2019 even worse. You might also want to conduct the same analysis on nighttime temperatures. They are having hotter and hotter nights as well. I posted this on Facebook and one denier, by the name of Richard Wakefield, claimed that the use of anomalies were not justified. When I suggested that he took it up with you he claimed that you refuse to reply to his comments. Could you please let me know if this is true? Mind you, if it is, I can understand why. He’s a poster child for the Dunning- Kruger effect. Most of the anti-anomalists I’ve seen seem to think that anomalies take away information about the “real” average temperature of the whole Earth and as well they note that figuring out the “real” average temperature is extremely difficult for all sorts of technical reasons and that anomalies are therefore some sort of cheat. That sort of thinking shows a definite lack of statistical and sampling knowledge. I guess I have a good memory as I remember him. 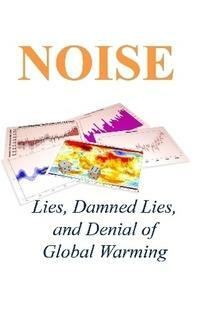 He used to comment at Climate Etc., and I believe he has commented here. A Canadian, if I remember right. You’e just wasting your time. Thanks for letting us know. Distressing, indeed. Thanks for the replies on Wakefield. Apparently he started a blog a few years ago complaining about the increase in electricty prices in Ontario. He claimed (and still does claim) that it was due to renewables. This was at a time when renewables made a negligable contribution to Ontario’s electricity supply. The peak of the event at a national scale was from 11 to 18 January, although heat persisted for longer in central and eastern areas. The Australian nationally-averaged mean temperature reached 40 °C on five consecutive days from 12 to 16 January. 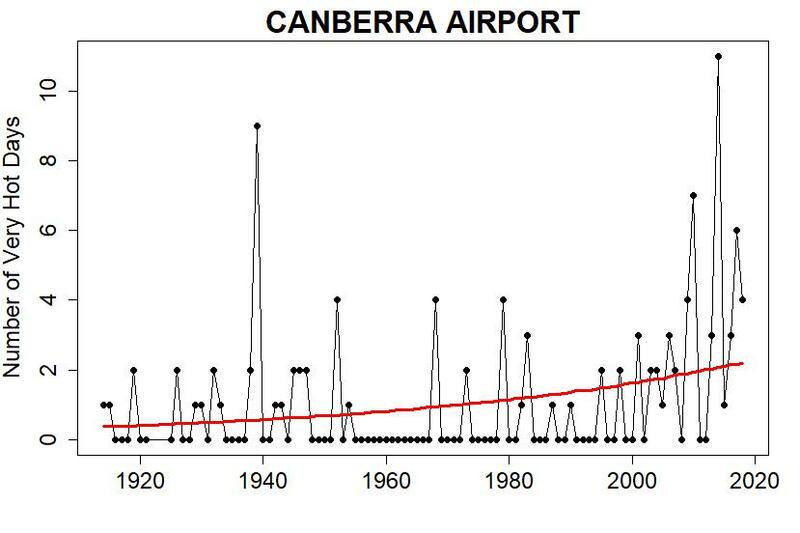 Prior to the 2018−19 summer, there had only been four days in total in 108 years (two in 1972 and two in 2013) when maximum temperatures had reached this level; this now means that seven of the ten hottest days on record averaged over Australia have occurred in the 2018−19 summer, five of them consecutively. Eight of the ten hottest daily mean temperatures, and six of the ten hottest nationally-averaged minimum temperatures, have also occurred this summer (Table 1). This makes this period clearly the most significant multiday heatwave on record at the national scale. What are the chances this happened in a non El Nino year?